I Spy . . . a Dinosaur! 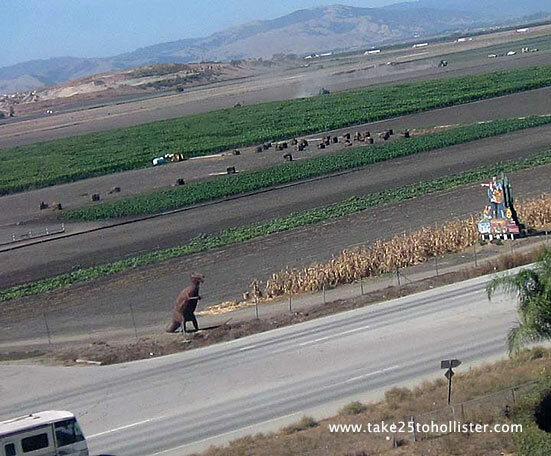 I spy with my little eye one of the Swank Farms' dinosaurs from the sky. Roarrrrrrrrr! By the way, the Swank Farms' corn maze and pumpkin patch are now open until October 31, 2016. If you haven't yet, go check out the fun. Swank's is located on San Felipe Road, just north of the Hollister Airport. Look for the dinosaur. 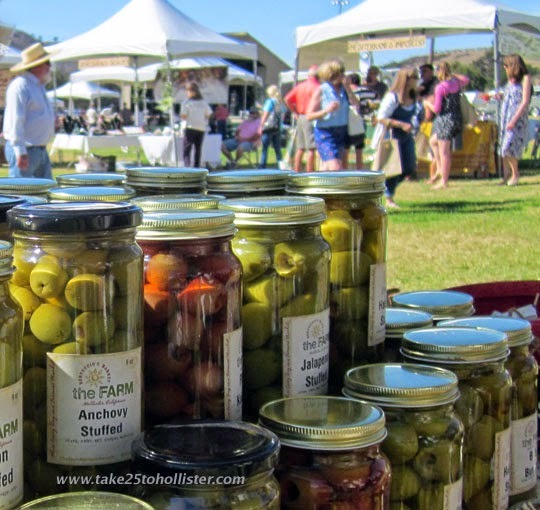 For more info, visit the Swank Farms website. Last Friday, the Husband and I celebrated our wedding anniversary by soaring high above our fair city. Yup. 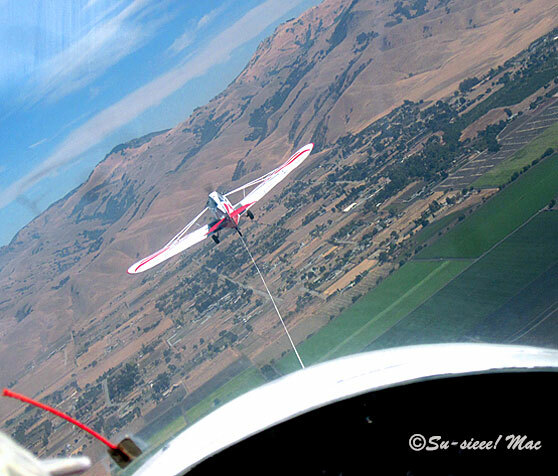 Through Groupon.com, we purchased discounted tickets for scenic sailplane rides with the Bay Area Glider Rides/Hollister Soaring Center, located at the Hollister Airport. 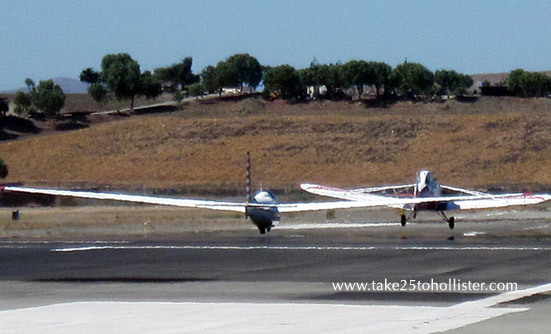 The local outfit has been offering scenic rides, soaring lessons, and glider towing services at the airport since 1993. About four or five years ago, it was purchased by Bill and Sharon, who are originally from Vermont. 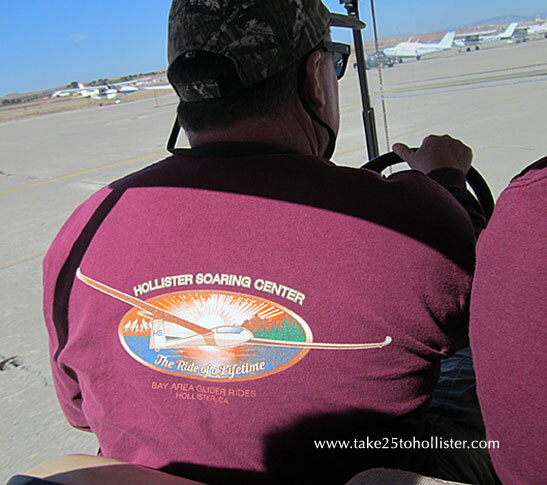 Bay Area Glider Rides is the only operation in the San Francisco and Monterey Bay areas to offer glider rides to the public. 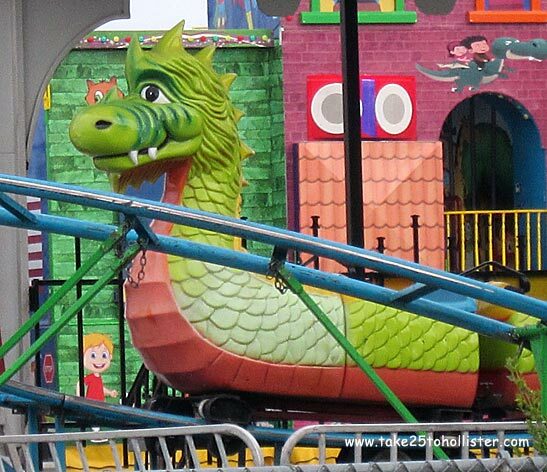 Depending on the ride, you soar over 4,500 to 6,000 feet. 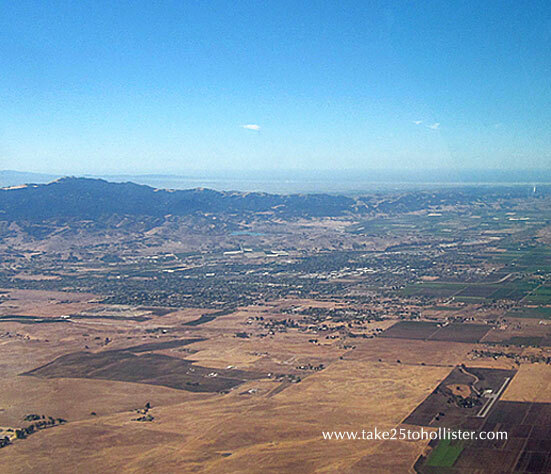 Two of the scenic rides fly around San Benito County, while the third soars above Monterey Bay. The sailplanes can accommodate two passengers, but the Husband and I purchased individual rides. The weight limit is 328 pounds for passengers, which uhm the Husband and I exceed. That was fine, more room in the back to sit. For the Husband's trip, the sailplane was towed to the west, where Pilot Bill and the Husband glided above Fremont's Peak. 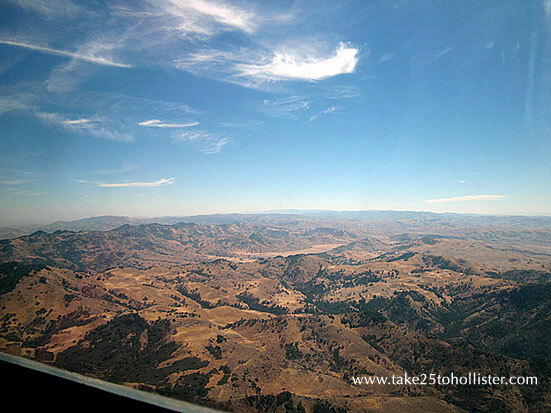 I was interested in seeing what it looked like above the Diablo range, so that's where Pilot Bill took me. 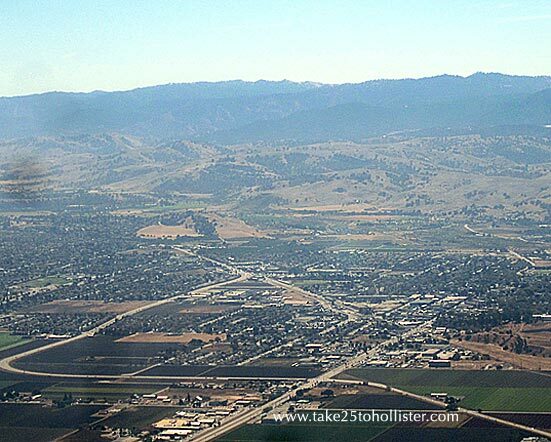 Here's how ditsy I can be: I thought that the Central Valley starts immediately behind the Diablo Mountains. So, I was very surprised to see a narrow valley beneath the eastern side of Santa Ana Mountain, and that there were a couple other ridges beyond that valley. Pilot Bill and Jake, one of the Bay Area Glider Ride employees, said it was a clear day for soaring. One of the best days in a long while. 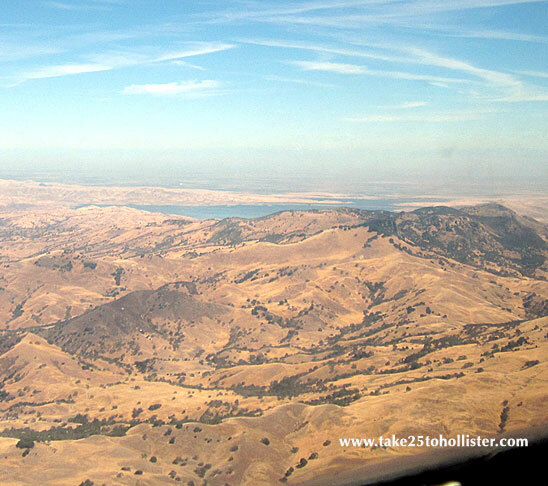 From the sailplane, Pilot Bill and I saw the San Luis Reservoir. I thought I could see the Sierras. Another thing I didn't realize is how near we really are to the ocean. 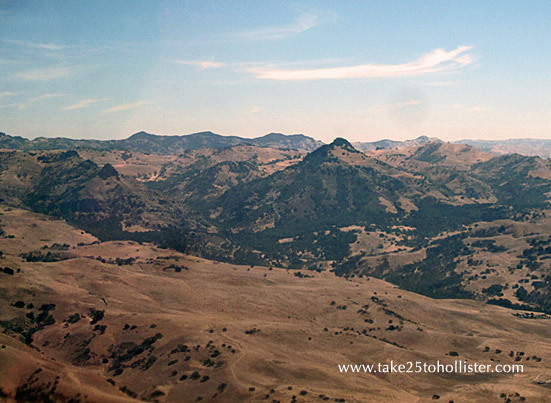 The Husband says that Hollister is about 23 miles from Monterey Bay as the crow flies. Caw, caw. 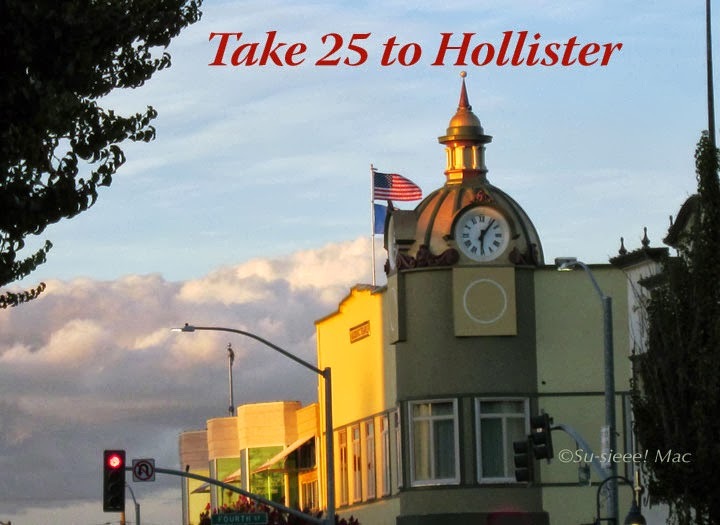 Is Hollister the county seat of San Benito County? A Bushel and A Peck of Talent! There was a great deal of local talent to be seen and heard this past Saturday afternoon. Young and old. Everyone of these artists were full of energy, passion, and delight. The youthful dance troupe in the photo above are students from Sammy's Animation Dance Community. They caught the Husband's and my attention immediately upon arrival at the annual LULAC Community Health Fair, which was held at the Hollister Community Center. The young men and women performed hip hop individually and together. They were popping and locking, tumbling, and doing all sorts of amazing choreographed and improvised steps. 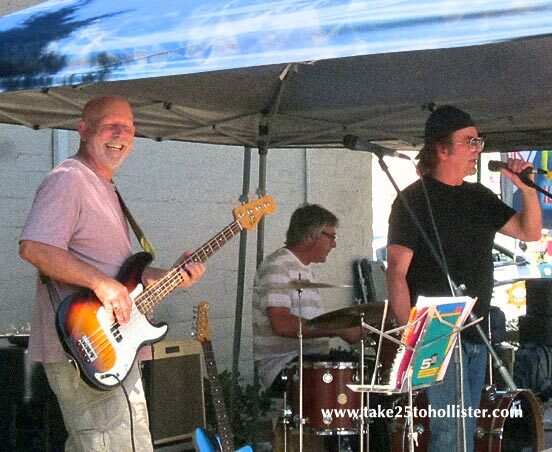 Moondance, a group of outstanding musicians, also performed at Saturday's health fair. 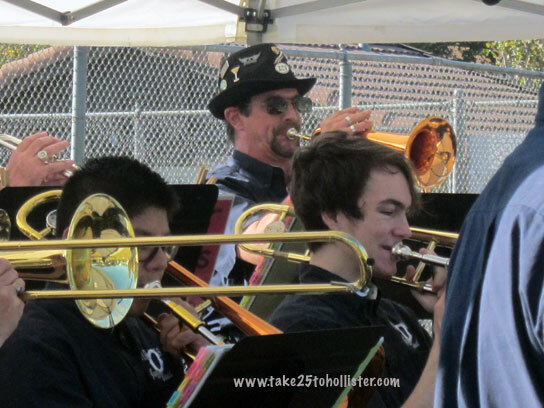 Actually, the Husband and I attended just to hear the band play. This band rocks big time! 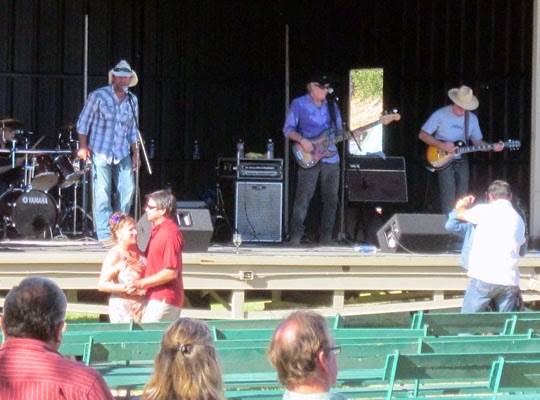 Originally formed in 1976, Moondance performs at local events as well as at private parties and various venues, such as Ridgemark County Club, Mom & Pop's Saloon, Chillin & Grillin Roadhouse, in and nearby Hollister. You can learn more about Moondance, along with hearing them play at its website. 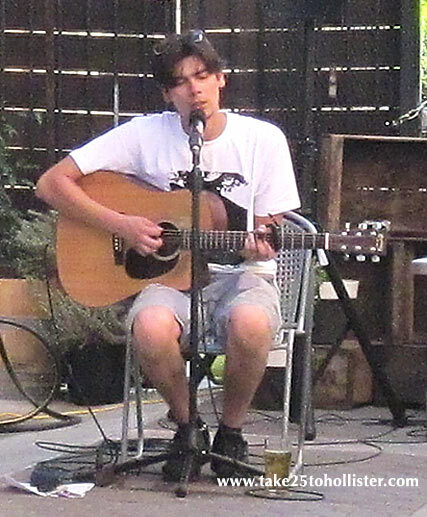 Zack Freitas was performing his original songs, along with popular cover songs, at Fisher's Delicatessen during the Downtown Hollister Beer and Bacon Crawl. Zach has a unique voice. Intense. Intimate. Thoughtful. Listen for yourself at Zack's website. Zack, Moondance, and the dancers from Sammy's Animation Dance Community are only the tip of talented artists from Hollister. We are fortunate! I Spy . . . A Lot of Fun to be Had. I spy with my little eye so many possibilities of things to do in San Benito County. 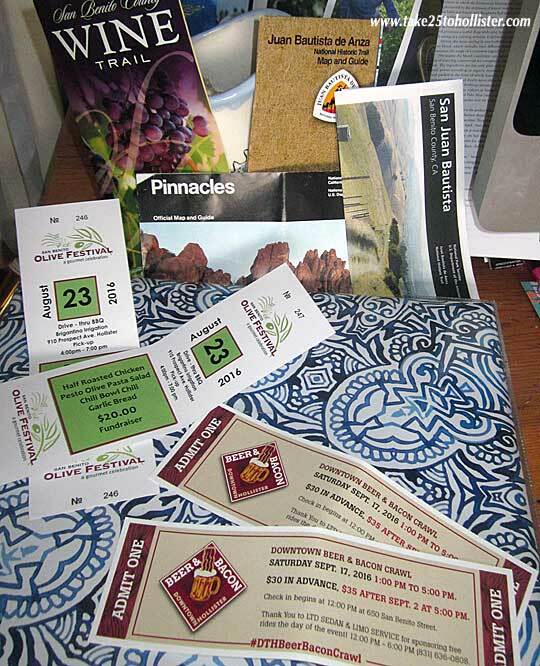 Just today, the Husband and I headed over to San Benito Bene in Hollister to purchase our tickets for the Gourmet Roasted Chicken Dinner Take-Out Fundraiser on August 23, 2016, for the San Benito Olive Festival. Yummmm. We also bought our tickets for the Downtown Beer & Bacon Crawl on September 17, 2016. I saw on the tickets that the LTD Sedan & Limo Service is offering free rides that day. Trés cool! What else? Well, how about. . .
And, lots, lots more. I could write a book. Maybe I ought to. What do you think? 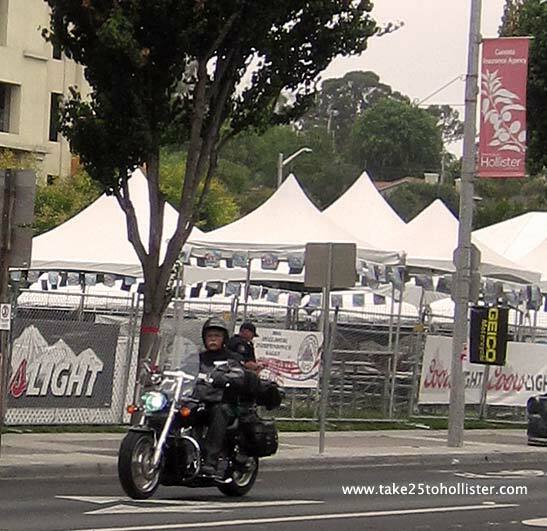 I spy with my little eye the first biker to rumble down San Benito Street when the gates to the 2016 Hollister Independence Rally officially opened this morning. 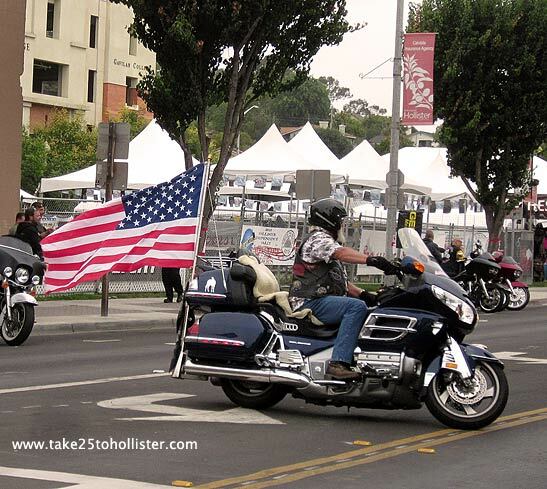 This annual biker rally is a three-day event, ending on Sunday, July 3. 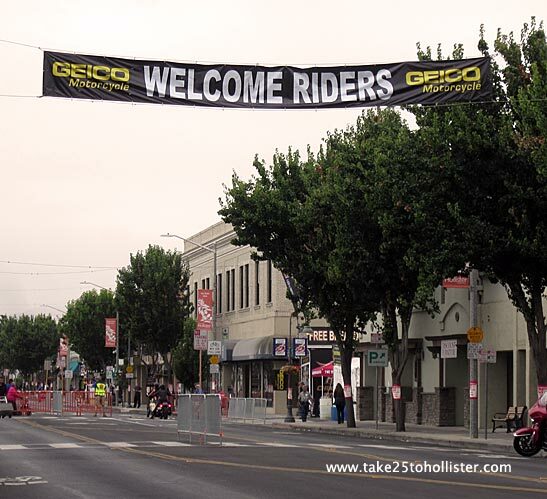 Thousands of bikers are expected to descend onto our small city, which some bikers describe as the Birthplace of the American Biker. If you want to know how our town got that designation, click here. Admission to the rally is free. There shall be lots of food and drink, activities, and three stages for bands and other live entertainment. For details, head over to the Hollister Independence Rally web site. 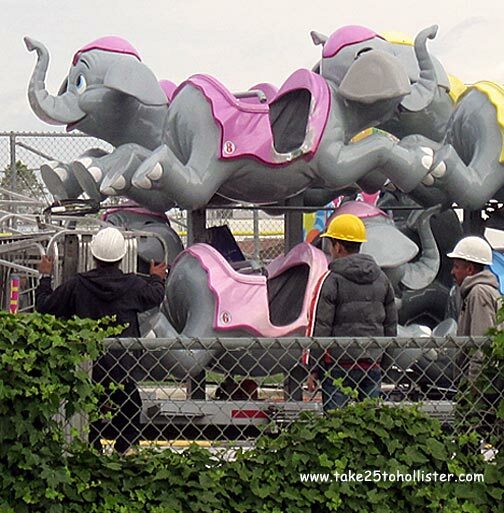 Anyone noticed the trucks full of carnival rides parked on San Benito Street next to the high school earlier this week? Yup. 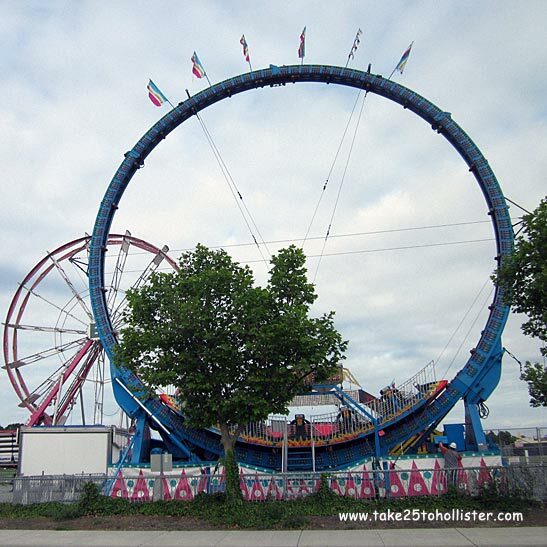 It's time for the annual May carnival that San Benito High School has been hosting for the last several decades. 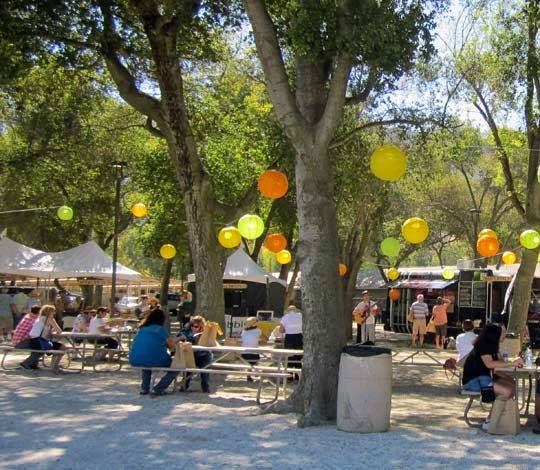 It'll be in the football parking lot, starting tomorrow evening, May 6, 5 p.m., and running until Sunday, May 8, 5 p.m.
ARTspace is the art gallery, 240 Fifth Street (east of San Benito Street), owned by the San Benito County Arts Council. 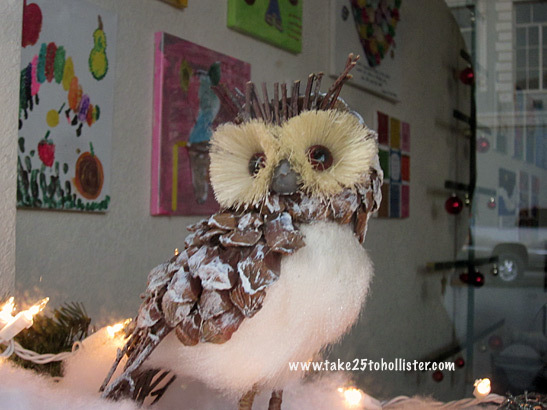 That's where you can find this cute white owl on display in the ARTspace window. Starting this Saturday, November 28, will be the 4th Annual Children's Art Exhibition, which will display art work by local schoolchildren. 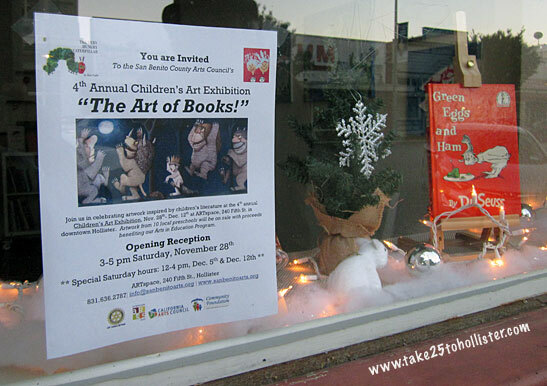 This year's theme is "The Art of Books!" The exhibit will run through December 12. On Saturday, from 3 to 5 p.m., ARTspace will hold an open reception. For more information, check out the San Benito County Arts Council website or Facebook page. 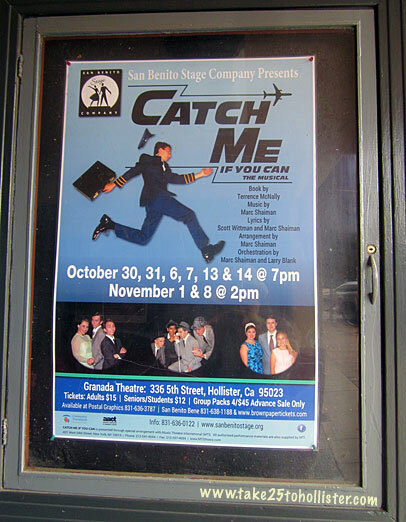 Catch Me if You Can, a Tony nominated Broadway musical, is now playing for the next two weekends at The Granada Theater in Downtown Hollister. It's presented by the San Benito Stage Company. 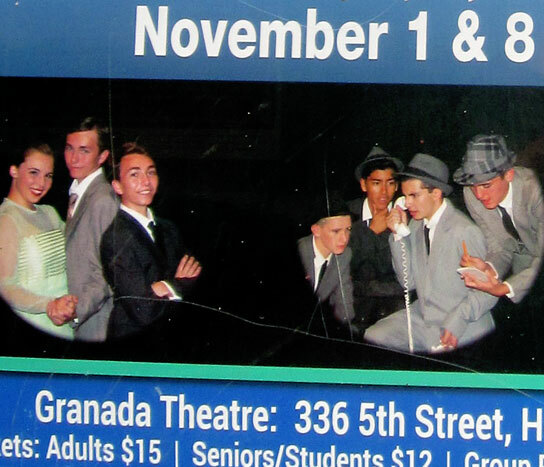 A very talented all-teen cast tells the story of real-life Frank Abagnale, Jr. in words, song, and dance. A con artist and check forger, Abagnale manages to stay two steps ahead of the FBI while impersonating a teacher, pilot, lawyer, or pediatrician. If the title and story sound familiar, then you probably saw the movie Catch Me if You Can, starring Leonardo DiCaprio, upon which the musical is based. So, you also know that Abagnale became an FBI instructor and consultant, helping the law enforcement agency investigate fraud and scam crimes. To learn more about the play, check out this article, "Preview: Catch Me if You Can: The Musical", written by Lois Locci at Benitolink. Friday, November 6, and Saturday, November 7, at 7:00 p.m.
Sunday, November 8, at 2:00 p.m.
Friday, November 13, and Saturday, November 14, at 7:00 p.m.
Tickets are available at the door, as well as at Postal Graphics and San Benito Bene. 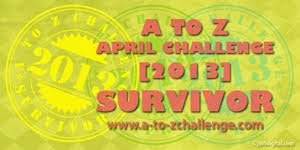 Admission for adults is $15, and $12 for children, students, and senior citizens. Yesterday, Hollister got a treat with a big-screen showing of Man from Reno, a neo-noir, cross-cultural, mystery movie, of which some of the scenes were set in Hollister, San Juan Bautista, and other parts of San Benito County. Whoo-hoo! The award-winning Man from Reno came out in 2014. It was co-written and directed by Dave Boyle who was at the showing and did a Q&A after the movie. An extra treat for us, movie-goers. The movie opens with Sheriff Paul Del Moral of San Marco County (think San Benito County) coming across an abandoned car on a dark and very foggy night. After a few minutes of investigating, he gets back into his car, drives several feet, and bang! A running man collides into his car. This unknown Japanese man is taken to the hospital (set in Hazel Hawkins Hospital), but, after recouping, walks away without anyone noticing. And, so begins the mystery. Meanwhile, 100 miles to the north, popular mystery author Aki Akahora has arrived in San Francisco. She has run away on a whim, no longer able to take all the adoration from fans in her home country of Japan. She's depressed and looks to be suicidal, but she breaks out of her funk when she meets a man who makes her feel like living again. He quickly moves into her hotel room, then, just as quickly, disappears leaving his suitcase behind. And, so begins another mystery. The movie moves forward between the two suspenseful stories. The only thing I predicted correctly was that the two tales would eventually intertwine. Everything else about the plot—surprise! Another enjoyable aspect of Man from Reno for me was recognizing settings in Hollister, San Juan Bautista, San Francisco, and Sausalito. As you read previously, the hospital scenes in the fictitious San Marco County were set inside Hazel Hawkins Hospital. I'll only tell you about one other setting. The sheriff's office was actually the Red Cross office on Fifth Street. Missed Man from Reno yesterday or want to see it again? The movie is now available at Netflix, Amazon, Google Play, DIRECTV, and other online sites. 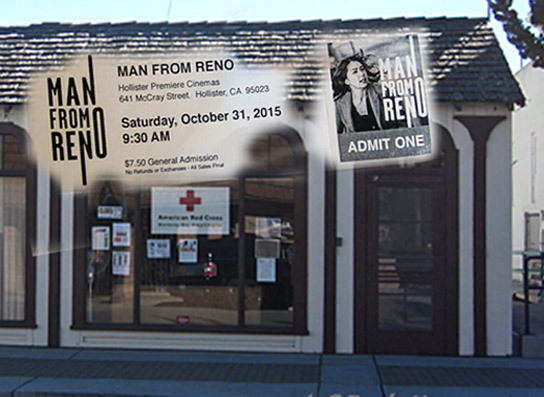 Want to learn more about the movie, check the Man from Reno website. 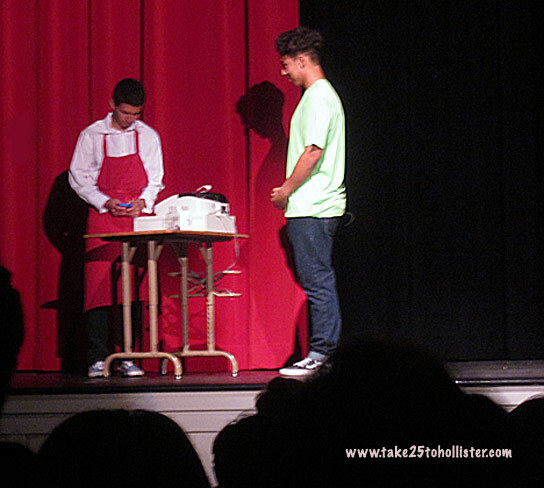 On Friday evening, the Husband and I enjoyed watching No Signs of Intelligent Life, a comedy performed by the San Benito High School Drama 3 class at the Baler auditorium. The play was about extraterrestrials from the far distant planet of Gilroy pretending to be humans so as to study them more closely. The space aliens are hilariously confused and dumbfounded with the ways of the humans as they relate to them in such situations as gossiping around the workplace water cooler, substitute teaching, dating, survival camping, and purchasing a fast food hamburger. The young men and women totally delivered the funny. Their passion and joy for the craft of acting was so infectious that I wanted to suddenly audition for a play. The drama department has several other performances scheduled for the rest of the year. No doubt, they'll be as entertaining as the one we saw. 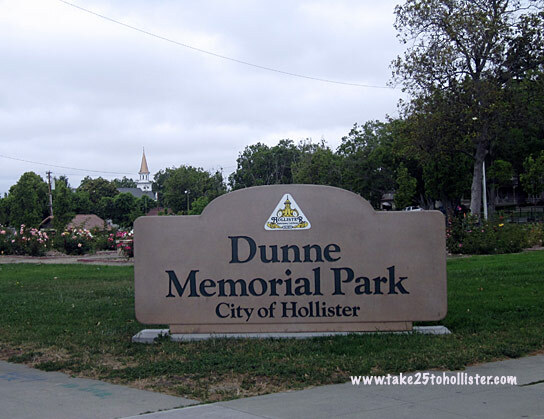 This Saturday, October 24, 2015, will be the last concert of the Music in the Park series in Dunne Park on Seventh Street in Downtown Hollister. The concert will run from 4 to 6 p.m. Bring your own blankets or low-back chairs, as well as snacks and drinks. No alcoholic beverages are allowed in the park. 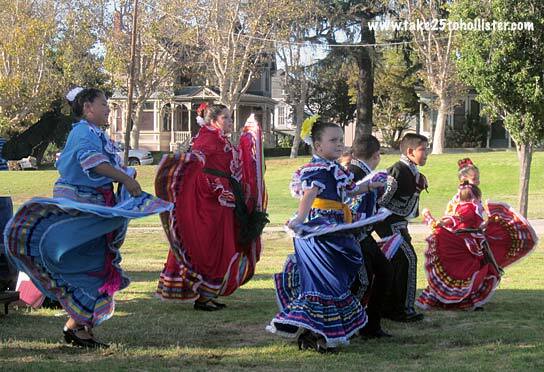 Performing from 4 to 5 p.m. will be Folklorico Juvenil de Lucy Rodriguez, a dance troupe composed of girls and boys, ages 3 to 15. The dance group performs traditional folkloric dances from Mexico. Closing out the concert will be The Flashbacks, which will perform from 5 to 6 p.m. 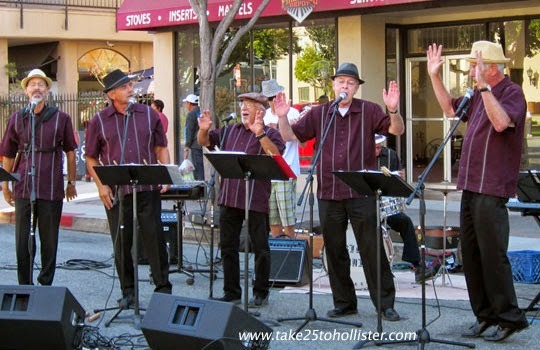 The local group, with its smooth voices, is popular for singing 1950s doo-wop songs. 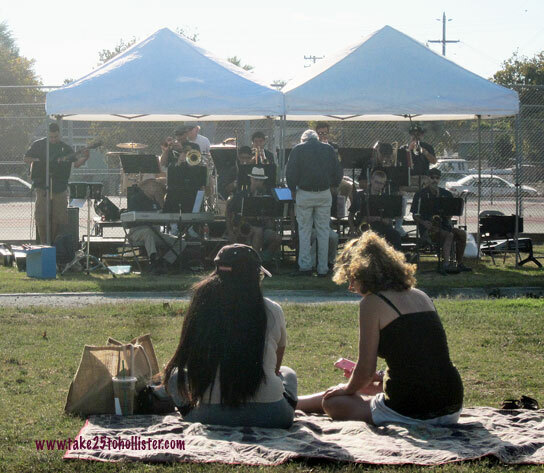 Music in the Park is a monthly concert sponsored by Mr. O's Academy of the Arts, which began this past August. The free concert series will return in Spring 2016. Thanks, Mr. O! 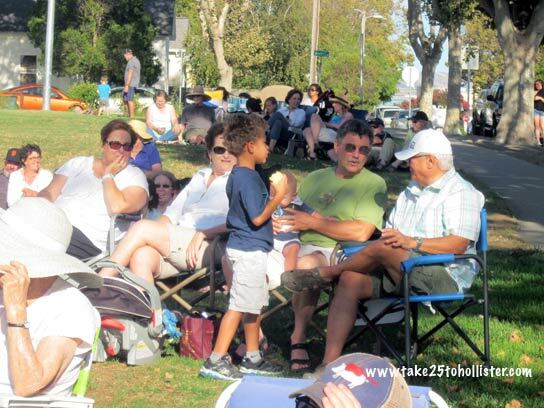 This afternoon is another Music in the Park concert in Dunne Park, at the corner of Seventh and West Streets. The free event, sponsored by Mr. O's Academy of Music, is from 4 to 6 p.m. Bring your own low-back chairs or blankets. Snacks, too. No alcohol is permitted in the park. 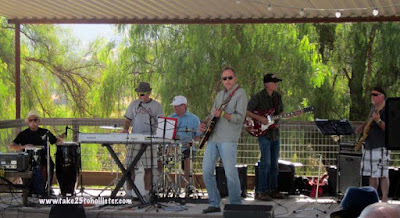 The Moondance Band, a 60s rock & roll band featuring Rich Haggett, performs from 4 to 5 p.m. Folklorico Juvenil, a children’s mariachi dance group featuring Lucy Rodriguez, performs from 5 to 6 p.m. 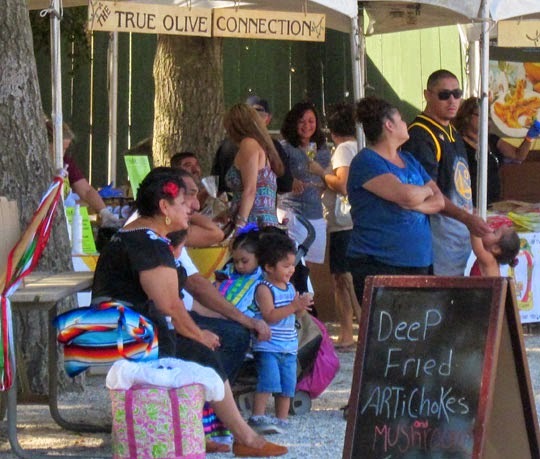 The Third Annual San Benito Olive Festival is only six Saturdays away! Saturday, October 17, 2015, from 10 a.m. to 5 p.m., to be precise. The place—Bolado Park in Tres Pinos, right off Highway 25, about eight miles south of Hollister. 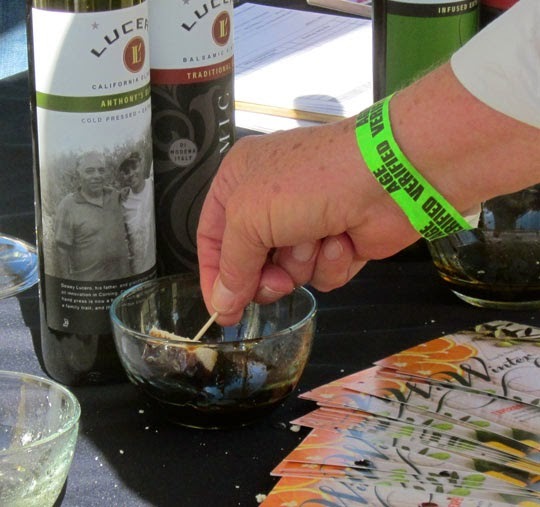 This foodie celebration honors the rich agricultural bounty and heritage of San Benito County, showcasing many of the local olive oil producers, winemakers, food artisans, fine artists, craftspeople, restaurants, and chefs. 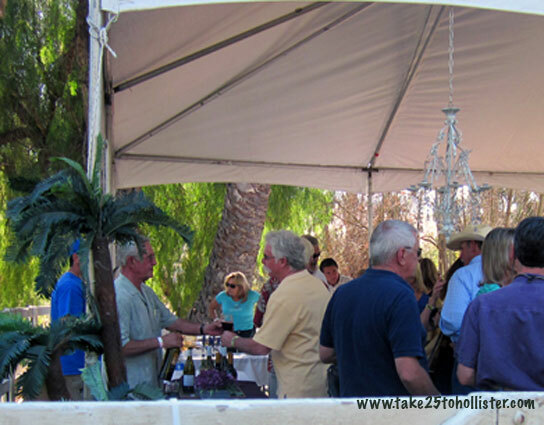 All net proceeds from the event are donated to nonprofit organizations in San Benito County. 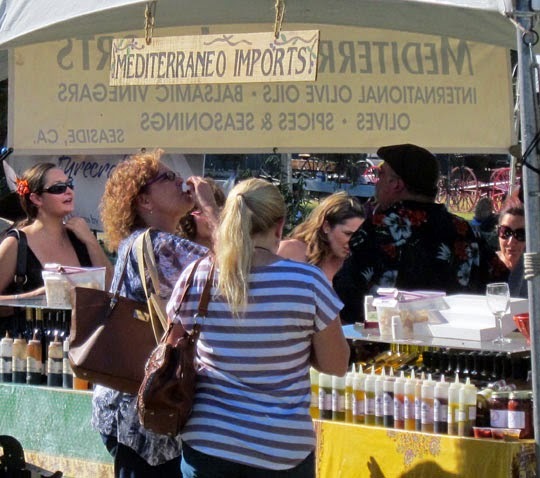 We will be tasting award-winning olive oils from such producers as Oils of Paicines and Brigantino Olio de Oliva as well as various types of olives from Papa Joe's Spicy Products and The Farm Bertuccio's. We will be checking out Blenheim apricots, balsamic vinegars, chocolates, and other culinary treats from Apricot King, Marich Premium Chocolates, Tantalizing Toffee, Vertigo Coffee, and California Balsamic. We will be trying out wines and handcrafted beers from Calera Wine, Guerra Cellars, Aimee June Winery, Firestone Walker Brewing Company, Grillin & Chillin Alehouse, and others. We will be having a hard time deciding from which restaurant or food truck to buy lunch—Fired Up Fresh, Kuki's Bowl, Paine's Restaurant, or another. 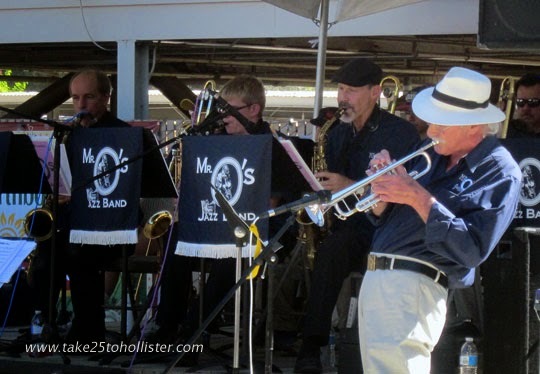 We will be listening—and maybe dancing—to local bands of different styles, from jazz (Mr. O's Jazz Band) to doo-wop (The Flashbacks) and more. 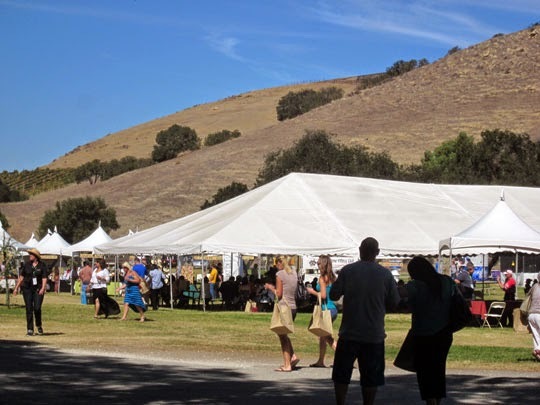 We will be meandering up and down aisles, checking out amazing art, crafts, jewelry, kitchenware, gift products by Italian artisans, garden items, and other lovely things from such merchants as the Gioia Company, Artistic Woodcrafts, McAbee Feed, and M & M Plant Sales Inc.
We will be venturing into booths of the San Benito County Historical Society and other nonprofit groups to learn more about the history, organic agricultural bounty, and the world in general about San Benito County. 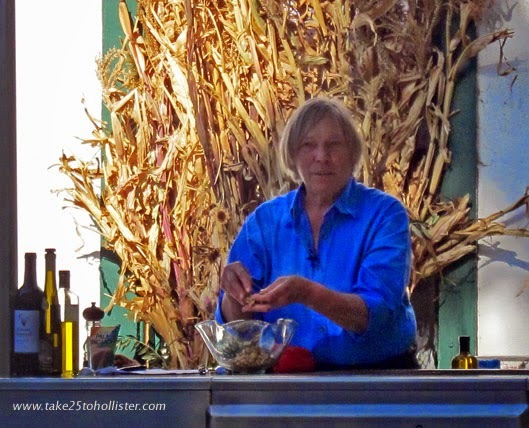 We will be enjoying the cooking demonstrations with olive oil by talented chefs, such as the ever popular Chef and Cooking Instructor Dorothy McNett and Executive Chef Cal Stamenov from the Bernardus Lodge & Spa in Carmel Valley. We will be tired, happy, and full by the end of the day. 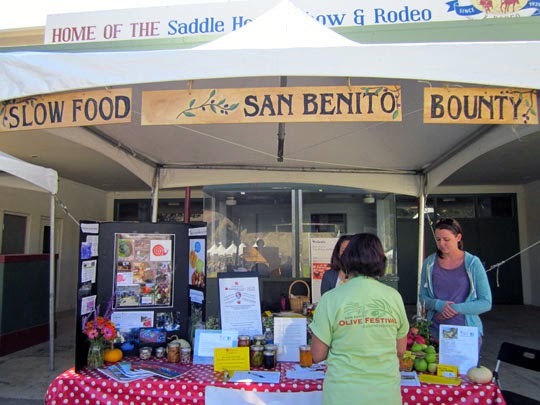 For the latest information about the San Benito Olive Festival, go to its website and/or Facebook page. To purchase tickets online, check out its Eventbrite page. It was a perfect lazy afternoon at Dunne Park yesterday. Just as Saturday ought to be—relaxing on the lawn, eating, watching kids play, chatting with friends, and listening to the music of our local bands. Dave Huboi & the Architecturals performed the first hour of the Music in the Park concert, while Mr. O's Jazz Bank played the second hour. We are fortunate to have wonderfully talented local musicians. The free Music in the Park concerts in Dunne Park were organized by Greg Harvey of the Joshua Inn Bed & Breakfast and Mr. O's Academy of the Arts. Last Saturday afternoon was the first of three concerts. The next two will be September 26 and October 24. They'll be both Saturday afternoon, from 4 to 6 p.m. Here are few more photos from Saturday. 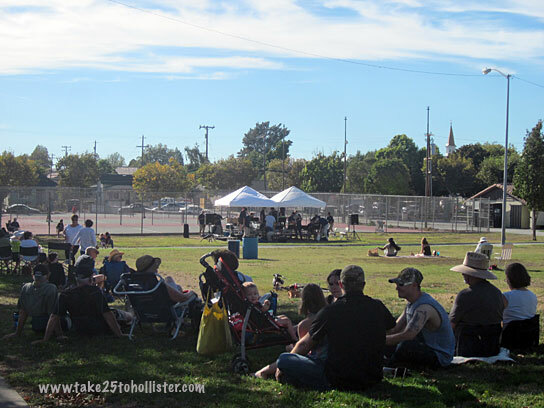 Saturday, August 29, 2015, is the date for the first of three upcoming free Music in the Park concerts in Downtown Hollister. Everyone is invited—young and old, singles and families. 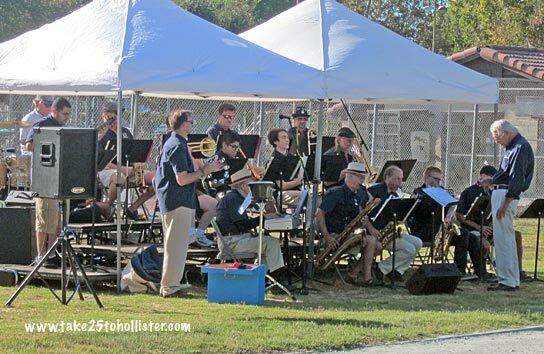 The concert will be from 4:00 to 6:00 p.m. at Dunne Memorial Park on Seventh Street, between West and Powell Streets. 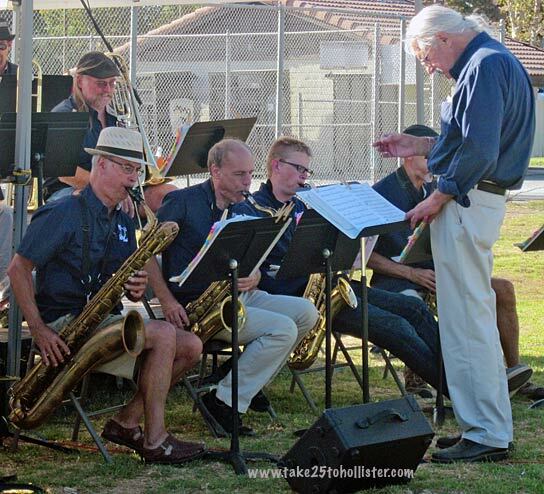 The performers will be Mr. O's Jazz Band and David Huboi and the Architecturals. The concerts will be held near the tennis courts. Planners say to bring a blanket and/or low-back chairs to sit on. And, yes, we can also bring a picnic or refreshments. Reminder: No wine, beer, or any other kind of alcohol is allowed in the city park. 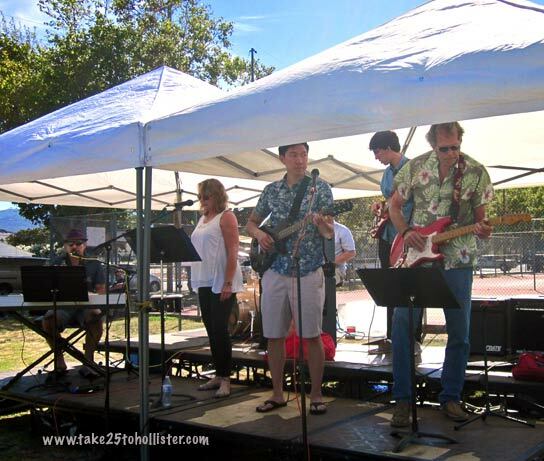 The next concerts will be September 26, 2015 and October 24, 2015. Both Saturdays. Mr. O's Academy of the Arts is sponsoring the free concerts. For more details on this Saturday's event, check out this Facebook page.